In my teens and 20s, becoming a better rider was about surviving in the sport. As a kid from a non-horsey family without enough money to buy and care for a horse, learning to ride well meant convincing other people to let you ride at a price you could afford. Well, that, and the personality factor. I have seen several talented but broke horsewomen betrayed by their own egos and smart mouths. I don’t want to paint myself as being scrappier or more subservient than I am, but I follow rules. I’m sensitive, and I often know how the wind is blowing. Put it this way: I am sometimes ill-equipped to deal with personality conflicts at the barn, but I am seldom surprised by them. That’s been enough to get by. Still, I am always telling myself that I should be scrappier. If I am having a lovely ride on a sensible horse that is kind and willing and well-trained, my internal monologue tells me that I am failing. “This is too easy. Once the owner decides they don’t like me anymore and stops taking pity on me and letting me ride this saint of a horse, it’s all over,” I berate myself. Bad rides are even worse. I’ve always been overweight, but it was only in my 20s that my weight climbed to the point where fewer horses were suitable for me. I worried even more about being a good enough rider. Riding well is always better for the horse, but it’s especially important when you’re asking the horse to carry more weight. I became deeply anxious about my riding flaws, sure that I was one messy transition away from losing riding privileges forever. I wish I could say that anxiety helped me grow, but I don’t think it did. Anxiety makes me tense in the saddle. A kind trainer who designed smart exercises and said “perfect” more often than “wrong” did more for me than my own nit-picking. For the past five years, whenever I rode during trips back to Virginia, the saint of a horse that I leased when I lived there always acted like it had only been a month or two since I rode last. Sure, I could feel a difference in my own fitness, but he still listened to me. 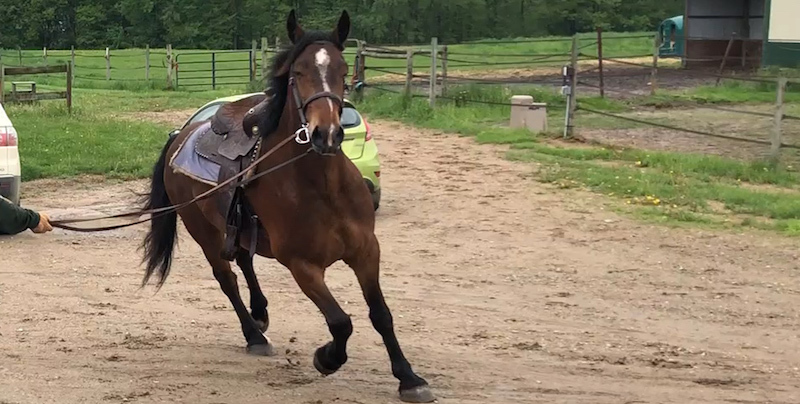 When I started horse shopping 5 ½ years after I moved home to Michigan, I knew I had lost some riding muscle, gained weight, and that my balance had shifted slightly, but I was optimistic about how quickly I’d bounce back. I felt competent. One horse near me sounded promising. He was a young draft-cross described as being great off property. I made an appointment to go try the horse, sans new trainer—who I’d interacted with online but hadn’t met yet. So I went alone. And it went very poorly. My own anxieties just did not mesh with this horse’s insecurity off property and away from friends. Photo by Karen Hopper Usher. The owner had recently bought the horse based on an online ad and was not happy with him when he arrived. She re-listed him. On the ground, I liked him. He had a kind but mildly worried eye. My immediate sense of him was that he was not an explosive horse, but it would take work to get him to concentrate. Since the owner had only put one or two rides in on him herself, I didn’t see much point in asking her to ride before me. She was an amateur too, with about the same information I had—the ad was copy-and-pasted from the original. I climbed up and started trying to figure him out. At first, he seemed mildly unfocused, but eventually it became clear he was flat-out buddy sour, marching right through all my aids until he was near his new friend. I have never been good with buddy sour. The recommended action—keep the horse moving near other horses and let it rest farther away—feels wrong and makes me nervous. The self loathing began. I was riding poorly. If I was riding poorly, I was never going to be allowed to ride again. The owner was going to tell me I couldn’t ride her horses anymore. But then, the fact that I was auditioning a horse, not the other way around, finally got through to my anxious, historically broke, fat-kid brain. I did not have to buy this horse. This owner had no power over me. Beating myself up over not being a good enough rider was pointless. Whether this would be the horse I spent the next decade trying to ride wasn’t only up to the owner. It was also up to me. I had the power to dismount. There was no trainer around to scream at me. There was only me realizing I didn’t have the skills to deal with this particular problem. I judged myself for wanting to get off a horse when it wasn’t going well. “We must always end our training sessions on a good note,” I scolded. But there were no good notes for me on this horse. The best thing I could do for this horse was to admit I had no control and set up a situation where I could safely dismount. For the first time ever, it just didn’t matter to me if it was my fault or not that the horse wasn’t going well. The question I’d always asked myself—how can I ride this horse better?—was the wrong question for the task at hand. The question was: Do I want to ride this horse at all? Before, I never thought I had a choice. Read all of Karen’s blogs.